Walmart exclusive?! Mine is the purple leader class! Last edited by Scramjet on Mon Mar 18, 2019 1:43 pm, edited 1 time in total. Sorry Cram. 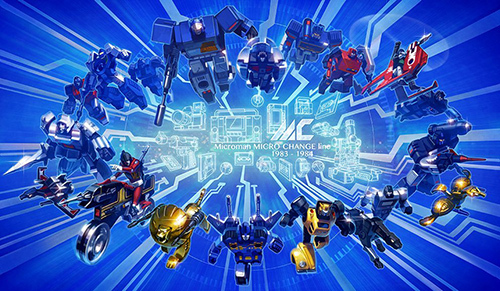 I guess the one I have is Megatron. I went to the galleries to look him up, but I can't tell what makes this exclusive different from the regular release. I always forget that he is Megatron because when I look at that sculpt all I see is Galvatron. I mean the horns, the abs, the knee caps. That aint Megatron, that's Galvy ALL THE WAY! Point is, the toy is awesome salsa! So big. So sturdy. You could drive a nail with that figure! 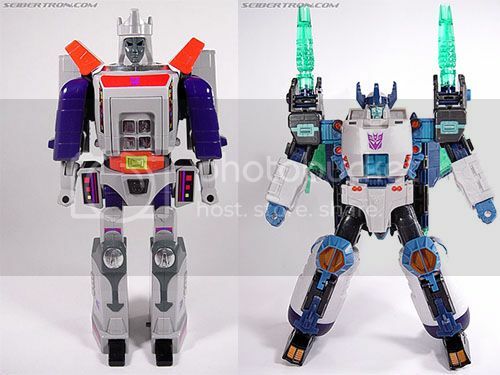 The purple version is so Galvatron it's not even funny, with the orange highlights and such!! Funny you mention the sturdiness. His right arm shoulder ratchet is weak now (the 360 rotation, not the lateral rotation) from years of holding the tank on his forearm. I still think he's the ballin'est Galvatron I have. Really need to get on picking up D62S. I've had so many opportunities over the years and I always let it slip. Well now, I say thee nay!! Here's Galvatron with his Energon Saber. Last edited by Scramjet on Mon Mar 18, 2019 1:43 pm, edited 4 times in total. Also, Cobro, wasn't the Walmart exclusive the battle pack of Megatron and Optimus? itscramtastic wrote: Here's Galvatron with his Energon Saber. Why just have an arm cannon when you can have a tank on your arm as a cannon? Scramjet wrote: Here's Galvatron with his Energon Saber. Last edited by Scramjet on Mon Mar 18, 2019 1:44 pm, edited 2 times in total. Sorry Buster, it's been a busy weekend with the chitlens, and home owning, and such. The two pack may HAVE been an exclusive. Honestly I didn't even know that exsisted until I was looking around in the galleries, trying to get all the versions straight in my head. It's cool that the two pack comes with a Voyager of the exact same toy. The one I have was definitely a Waly exclusive. I remember ordering it from walmart.corn, but I still can't tell what makes it exclusive. I actually have a hunch that it was a re-release of sorts, in that it was released while Cybertron was in full swing. Another reason I look at this version and see Galvatron, is because the Hasbro release G1 toy was mostly grey. Than the Takara version did him in colors that were more to the movie design. There is no question that which ever paint job, the sculpt is unmistakably Galvatron. Those colors on yours are dope. They certainly GALVANIZE the idea of him being galvatron. Anyway, on my shelf he is and always will be Galavatron. Because the world, (and the Collect-o-tron) always needs more Galvy. Cobotron wrote: Sorry Buster, it's been a busy weekend with the chitlens, and home owning, and such. At the time when Energon was around, I was reading the DreamWave comic, not following the cartoon. I saw that Megatron and was like "THEY'RE GONNA MAKE HIM GALVATRON!!!!!!" and I waited until I found him one day. So much patience in my youth. Last edited by Scramjet on Mon Mar 18, 2019 1:44 pm, edited 1 time in total. I also think that's why I really want that D62S re-issue of G1 Galvatron. Those two will look great next to each other. Then Titan Wars Galvatron will join them. And then DX9 Tyrant/XTB Abaddon (still undecided on which one, although DX9 is paid off at BBTS). BTW, did you see the updated pictures of XTB Eligos (Cyclonus)?! He looks awesome!! Picked up Robots in Disguise Warrior Class Gold Armor Grimlock today. His arms and outer leg sections seem floppy. Not a bad little figure I guess..
Last edited by Scramjet on Mon Mar 18, 2019 1:45 pm, edited 1 time in total. Ooooo look I'm on the Internet... Oh wait..
Is that legion or warrior class? Also, I know cubicle walls when I see them! carytheone wrote: Ooooo look I'm on the Internet... Oh wait..
Also, I know cubicle walks when I see them! Which is the deluxe? Warrior it is! Also, a cubicle wall so I can hang stuff, as the wall wall is cinderblock. Hooray basement I.T. (Crowd)! Warrior is "deluxe". After playing with Wreck Far and WFC Megs I sure miss a more complex deluxe class. It doesn't appear the TR line is going get back to that any time soon either. At least without them all needing to. Combine we can get some unique transformations. carytheone wrote: Warrior is "deluxe". After playing with Wreck Far and WFC Megs I sure miss a more complex deluxe class. HEY LOOK! Cary's on the intraweb! Oh Cram you got me all excited when you said Legion. Glad you like him though. Cobotron wrote: HEY LOOK! Cary's on the intraweb! My apologies for the false excitement. Yeah he's a cool figure. I've got both Greenlock and Goldlock. Goldie give me all them feel good G1 tinglies. Sometimes I consider a head swap, I really like that jangly toothed grin Greeny has. I'm going be jealous of all the folks that nabbed the Tak Voyager flavor. Speaking of RID15, I just got the regular OP. I really like him inspite of what some of them haters say. I did do the peaugh mod to move his mittens out of the way. itscramtastic wrote: My apologies for the false excitement. carytheone wrote: I'm going be jealous of all the folks that nabbed the Tak Voyager flavor. You know what I am excited about though? I wanna hear what Cthe1 scored from Cramitup. I gather Wreck-Gar and Megalotron, anything else? Hmmm.... Looks like I stopped getting updates on that thread. As far as what I got... Life's been pesky lately. I was about to post some stuff sunday, but lost power as I was setting up the lights, then just busy. Got Gen Wreck Gar, WFC Megs and bomber plane Megs. I've been on a Megatron kick lately. Cary got 3, Cobs got 5, which means there's 80 something left for the picking!! Last edited by Scramjet on Mon Mar 18, 2019 1:46 pm, edited 1 time in total. Used my credit at BBTS for MP Wheeljack and MP Lambor, as well as the Dr. Wu "New Partners" head upgrades for MP 21 Exosuit (SPIKE!! Or Daniel if you are crazy). AND THEN: I used my credit at TransformerLand for MP Bumble!! 4,017 pages were recently viewed by 720 unique visitors. This page was viewed 1 times on Saturday, April 20th 2019 7:51pm CDT. © 2019 Seibertron, Inc. DBA Seibertron.com. All Rights Reserved. Established June 2000. Seibertron.com is owned by Ryan Yzquierdo.